Seventeen is an American teen magazine. The magazine's reader-base is 13-to-19-year-old females. It began as a publication geared toward inspiring teen girls to become model workers and citizens. Soon after its debut, Seventeen took a more fashion- and romance-oriented approach in presenting its material while promoting self-confidence in young women. It was first published in September 1944 by Walter Annenberg's Triangle Publications. The first editor of Seventeen, Helen Valentine, provided teenage girls with working woman role models and information about their development. Seventeen enhanced the role of teenagers as consumers of popular culture. The concept of "teenager" as a distinct demographic originated in that era. In July 1944, King Features Syndicate began running the comic strip Teena, created by cartoonist Hilda Terry, in which a typical teenager's life was examined. Teena ran internationally in newspapers for twenty years. After Seventeen was launched in September 1944, Estelle Ellis Rubenstein, the magazine's promotion director, introduced advertisers to the life of teenage girls through Teena, selling advertising in Seventeen at the same time. From 1945 to 1946, the magazine surveyed teen girls in order to better understand the magazine's audience. The magazine became an important source of information to manufacturers seeking guidance on how to satisfy consumer demand among teenagers. Today, the magazine entertains as well as promotes self-confidence in young women. Sylvia Plath submitted nearly fifty pieces to Seventeen before her first short story, "And Summer Will Not Come Again", was accepted and published in the August 1950 issue. Joyce Walker became the first black model to be featured on the cover of Seventeen magazine in July 1971. In the early 1980s, Whitney Houston was also featured on the cover of the magazine. News Corporation bought Triangle in 1988 and sold Seventeen to K-III Communications (later Primedia) in 1991. Primedia sold the magazine to Hearst in 2003. Seventeen remains popular on newsstands today despite greater competition. In 2010, writer Jamie Keiles conducted "The Seventeen Magazine Project", an experiment in which she followed the advice of Seventeen magazine for thirty days. In 2012, in response to reader protests against the magazine's airbrushing its models' photos, Seventeen ended its practice of using digital photo manipulation to enhance published photographs. (See more below under Controversy). In August 2016, Michelle Tan was fired from her position as Editor in Chief while she was on maternity leave. It was announced shortly thereafter that Michele Promaulayko, who was appointed Editor in Chief of Cosmopolitan, would also serve as Seventeen's editorial director. Starting with their Dec/Jan 2017 issue, the magazine was to start publishing only six issues a year instead of ten, to focus on their online presence to appeal to the Generation Z market. In October 2018, it was announced that Jessica Pels would take over from Promaulayko as Editor in Chief of Cosmopolitan, and that Kristin Koch was appointed Seventeen's new Executive Director, overseeing all its content. In November 2018, it was announced that Seventeen's print edition would be reduced to special stand-alone issues. 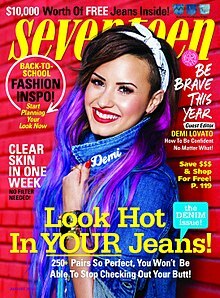 The South African edition of Seventeen magazine is published by 8 Ink Media based in Cape Town. The editor is Janine Jellars. The Philippine version is published by Summit Media, but it ceased publication in April 2009. The Hispanic American edition is published by Editorial Televisa. The Indian edition is published by Apricot Publications Pvt. Ltd in Mumbai. The Malaysian version of Seventeen is published by Bluinc. Seventeen Singapore is published by SPH Magazines. The Thai edition of Seventeen is published by Media Transasia Limited in Bangkok. In the United Kingdom there is no Seventeen magazine, but there is a similar magazine recently touted as a fresher and edgier competition to Teen Vogue called Company. The Japanese version of Seventeen is published by Shueisha Publishing Co., Ltd.
Seventeen has also published books for teens, addressing such topics as beauty, style, college, health and fitness. Seventeen was a sponsor of America's Next Top Model. The winners of America's Next Top Model from seasons 7 through 14 have each graced a cover of Seventeen magazine, including CariDee English, Jaslene Gonzalez, Sal Stowers, Whitney Thompson, McKey Sullivan, Teyona Anderson, Nicole Fox, and Krista White. Originally, the magazine only planned on sponsoring the show from cycles 7 through 10; however, with such a high success rate and a great opportunity the magazine provided for these women, the magazine sponsored the cycles until the show decided to move the winners to Vogue Italia. In 2011, Seventeen worked together with ABC Family to make a film about a girl who gets bullied online called Cyberbu//y. The point was to raise awareness of cyber bullying and to "delete digital drama". The film premiered July 17, 2011 on ABC Family. In April 2012, 14-year-old Julia Bluhm from Waterville, Maine created a petition on Change.org titled "Seventeen Magazine: Give Girls Images of Real Girls!' advocating for the magazine publication to vow to print at least one unaltered and Photoshop-FREE monthly photo spread". As a self-proclaimed "SPARK Summit Activist", Bluhm petitioned for an end to digital photo manipulation. In May 2012 Bluhm, her mother, and a group of fellow "SPARK Summit" members were invited to the New York headquarters of Seventeen by editor-in-chief Ann Shoket. On 3 July 2012, Bluhm announced that her petition had "won" after receiving almost 85,000 signatures online, resulting in Seventeen's editorial staff pledging to always feature one photo spread per month without the use of digital photo manipulation. Furthermore, Seventeen's editor-in-chief Shoket published an editorial praising The Body Peace Treaty in the August 2012 Seventeen issue, offering the push against digital photo manuipulation as an extension of the magazine's ongoing Body Peace Project. Seventeen was a sponsor of Project Runway: Threads, now a sponsor of Project Runway: Junior. The winners of Project Runway: Junior from seasons 1 & 2 have had their designs feature in a fashion spread of Seventeen magazine including Maya and Chelsea. From September of 1944, there are four different logos for this magazine. The first and current logo has been in use from September 1944 to June 1977, and is in the use again from January 2004, the second logo has been in use from June 1977 to August 1992, the third logo has been in use from August 1992 to February 2002, and the fourth logo has been in use from February 2002 to January 2004. ^ "eCirc for Consumer Magazines". Alliance for Audited Media. June 30, 2017. Retrieved November 20, 2017. ^ "Seventeen Delivers Almost Twice The Audience of Teen Vogue". Seventeen Actionista. Hearst Magazines. Retrieved 7 January 2011. ^ "Tweens, Teens, and Magazines" (PDF). Kaiser Family Foundation. January 2013. Retrieved 19 August 2015. ^ Massoni, Kelley (March 2006). "'Teena Goes to Market': Seventeen Magazine and the Early Construction of the Teen Girl (As) Consumer" (PDF). The Journal of American Culture. 29, Number 1 (Theme Issue). Archived from the original (PDF) on 2012-09-04.